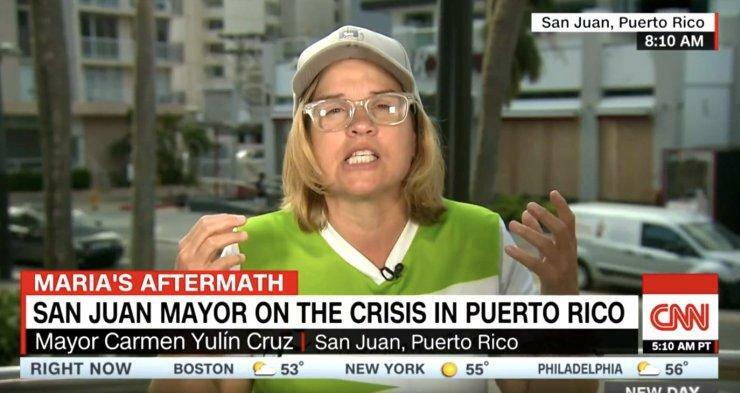 The Mayor of San Juan, Puerto Rico - Carmen Yulín Cruz (D), along with her administration and several suppliers, are under FBI investigation for corruption according to El Vocero de Puerto Rico. The FBI reportedly launched the probe following a Feb 21 lawsuit filed by the former director of procurement, Yadhira Molina, who alleges that officials punished him for reporting "alleged irregular acts" by the procurement division of Mayor Cruz's administration which occured in 2015 - which may explain supply shortages during Hurricane Maria in 2017 which Mayor Cruz blamed on President Trump, and others have pointed to a union strike. According to the suit, a supply company incorporated shortly after Cruz became mayor was awarded "preferred supplier" status, which paid them 3x more than "regular suppliers," and that city officials engaged in a corrupt scheme to steer business their way. The lawsuit states that during the Fiestas of Calle San Sebastián in 2015, Molina began to notice a frequent practice that consisted of his supervisors making requests for purchase orders in the afternoons or quotations for suppliers to deliver them the next day. It is alleged that given the "pressure" for the artificial time of the orders, the municipality of San Juan paid "preferred suppliers" three times more than the "regular suppliers", since the former could deliver them in a short time. The document mentions that among the preferred suppliers was Lionel Pereira from BR Solutions Corp., a company that was allegedly incorporated on February 23, 2013, shortly after Cruz Soto became mayor. In some cases, the "preferred supplier" would receive a list of materials and specifications in advance so that they were ready for the upcoming order. Presumably, because BR Solutions Corp. had the knowledge that it would be selected, it obtained the materials weeks before the municipality of San Juan issued the requisition of purchases. One source told El Vocero that high-ranking current and former city employees have been interviewed by federal agents in connection to the probe - and say that the FBI has documentary evidence in the case. Cruz made headlines in the aftermath of Hurricane Maria for her public spat with President Trump - who she accused of withholding supplies after initially praising FEMA relief efforts just days before, which prompted him to call her "nasty," an insult he previously bestowed upon Hillary Clinton. She embraced Trump's insult, donning a black t-shirt that read "NASTY." Later, speaking in front of a giant stack of US aid pallets, Cruz accused Trump of "killing us with the inefficiency and the bureaucracy." “What us Puerto Ricans need is the U.S. Armed Forces to come in and distribute the aid. And that they stop the Governor, Rossello, and the Mayor, Yulin, from continuing on doing what they’re doing. It’s an abuse; it looks like communism, in our own island,” the caller said. Meanwhile, another explanation seems just as likely; according to the Conservative Treehouse, San Juan teamsters didn't show up for work to distribute supplies. "…They have the generators, water, food, medicine, and fuel on the ground, yet the supplies are not moving across the island as quickly as they’re needed. WAPA Television confirmed that the strike is related to a recently passed law known as “The Senate Project 525 meant to Administratively Transform the Public Service Commission.” The law covers the recognition of UBER and other transportation methods but Rodriguez refuses to listen to reason or hear related facts. The law is more commonly known as “The Senate’s 525 Project.” This video should dispel the rumors as to whether or not the supplies are sitting in the port because there isn’t fuel or because the drivers have been instructed NOT to drive.